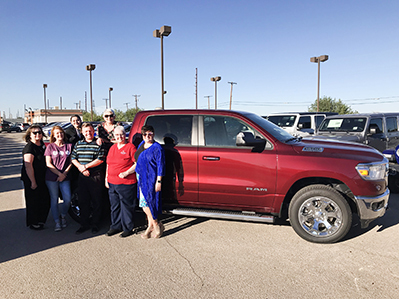 Members of the Artesia Altrusa Club pose with Tate Branch of Tate Branch Auto Group alongside the shiny prize that will be awarded to anyone making a hole-in-one at the upcoming 17th Annual Altrusa Golf Scramble: a Dodge Ram pickup. Pictured from left are Carolyn Christian, Margo Rand, Sienna Ochoa, Branch, Sue Pemberton, Connie McIntire and Ashley Mason. The golf scramble will begin at 9 a.m. Saturday, Oct. 6, at the Artesia Country Club. Individual entry is $30 plus cart and greens fees. Mulligans are available for $5 at check-in. To register, contact Juan Jimenez at the pro shop, 746-6732.